Probably the best thing that happened to me last week was that I read an ARC of Kenneth Oppel's Such Wicked Intent. You should read this book, too, and I will tell you why. Some backstory first, as there was a book before this called This Dark Endeavour. Meet young Victor Frankenstein and Elizabeth. This is how people in old-timey times dress. I know this, because I have watched The Vampire Diaries and there is no way the CW would lie to me about factual things like clothing and vampires. 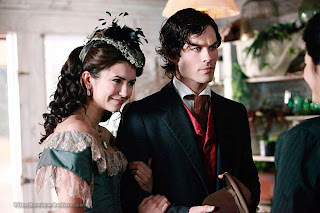 Anyway, in Victor is totally thinking it is so annoying that my beautiful cousin who is in love with my brother doesn't want to get with me. I am an awesome dude. Check out my expressive eyebrows! My brother Konrad doesn't have expressive eyebrows. For reasons I won't go into—SPOILERS—Such Wicked Intent opens with Victor evaluating his life decisions, and reaching the obvious-if-you-read-the-book conclusion that many of them didn't go well for him. Victor: I am possibly about to make another terrible life decision. I should ask Elizabeth and my friend Henry what they think of my decision before I make it. Elizabeth: THAT IS A TERRIBLE LIFE DECISION. WE'RE ALL GOING TO GO TO HELL. THAT IS HOW AWFUL YOUR LIFE DECISIONS ARE. Henry: I agree that your life decisions are usually not the best, but I'm less convinced about the going to hell thing. Victor: Doing it anyway! And you guys are totally going along for the ride. Get in this metaphorical car so we can begin our roadtrip of awesomeness fueled by my terrible life decisions, occult shenanigans, and substance abuse allegory. Yeah. There's an obvious substance abuse allegory in this, which is quite well-handled. 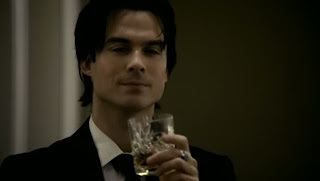 It's not drinking, but to avoid spoilers I will use this picture of Damon drinking in lieu of a picture with the things Victor gets hooked on photoshopped into this picture of Damon drinking. You're welcome. I also enjoyed the part where Victor begins to question said terrible life decisions of the earlier part of the book and is like why won't anyone listen to me now when I'm pointing out that I think I made a horrible mistake? 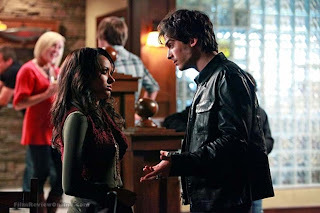 Here is a picture of Bonnie looking disbelieving to indicate that no one is listening to Victor when it really matters. Seriously, Such Wicked Intent filled me with glee. It's one of the most fun books I've read yet this year. It's also one of those instances of second book being arguably better than the first plus a middle book in a trilogy that doesn't read like a placeholder between the first and third books. I mean, I question why Kenneth Oppel needs so many exclamation marks in his dialogue, but he can construct and execute a plot brilliantly. Which is crucial, because most of us have a general idea of what happens in Mary Shelley's Frankenstein. We know where Dr. Frankenstein ends up, which people have told me made them shy away from reading Oppel's trilogy. That is a terrible life decision, because watching young Victor grow into that person is fascinating. But there are people who don't like Macbeth or Hamlet, so each reader to her own. Such Wicked Intent is both Victor being terrible and Victor being redeemable. I'm a little worried the glee of this book is cushioning the blow of pain, heartbreak, and less amusing terrible life decisions in the next book. Not that it matters, because I'm going to read the hell out of it, because Oppel's Victor Frankenstein is one of the most fascinating anti-heroes in Teen fiction. Right up there with Cassel Sharp. This Dark Endeavour is currently available in a paperback with a gorgeous cover, and Such Wicked Intent comes out in August. Victor Frankenstein ends up in the Canadian Arctic, right? 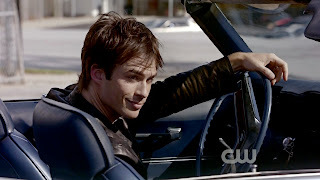 Which is pretty close to my house, I figure, and if he has expressive eyebrows like Damon, I am more than fine with that. I've enjoyed some of Kenneth Oppel's writing for younger readers, so I'll check this one out too.